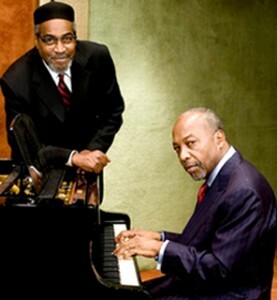 Kenny Gamble (left) & Leon Huff. 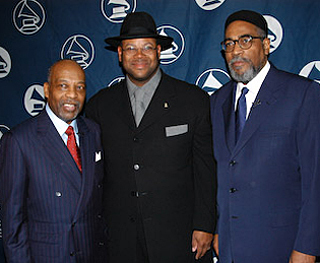 Forty-five years after Kenneth “Kenny” Gamble and Leon Huff launched a songwriting and production partnership that brought the immortal ‘Sound Of Philadelphia’ brand of soul music to the world, the duo was inducted into the Rock & Roll Hall of Fame with the newly-named Ahmet Ertegun Award (formerly the ‘non-performer category’) at a ceremony at the Waldorf-Astoria Hotel in New York City. In creating one of the most recognizable and influential catalogs in music history, the multi-platinum duo has written and produced numerous hits that reached #1 on both the pop and R&B charts. In addition, they have won five Grammy Awards, including the Recording Academy’s Trustees Award in 1999. Their instantly recognizable ’70s classics ‘Love Train,’ ‘Backstabbers,’ ‘If You Don’t Know Me By Now,’ ‘Me And Mrs. Jones’ and ‘You’ll Never Find Another Love Like Mine’ are just the beginning of a repertoire that also earned them an induction into the Songwriters Hall of Fame in 1994, plus honors from the Rhythm & Blues Foundation and the Academy of Composers and Songwriters (the Ivor Novello Award). It has been reported that one of Gamble & Huff’s songs is played on the radio somewhere in the world every 13.5 minutes – and now, a whole new generation of listeners will be able to get on the ‘Love Train’ thanks to an August, 2007 agreement between their Philadelphia International Records and Sony BMG Entertainment’s Legacy Recordings. The new PIR licensing agreement will allow Legacy to release PIR recordings drawn from the entire history of the label. The release schedule began late last year with double CD Essentials collections by Lou Rawls and Teddy Pendergrass. The second round of releases in the PIR re-issue project, Conquer The World: The Lost Soul of Philadelphia International Records and The Sound of Philadelphia: Gamble & Huff’s Greatest Hits, were released March 4. The 14 classics on the Greatest Hits compilation celebrate their vision as hitmakers, educators and keepers of the cultural flame with songs by the O’Jays, Harold Melvin & the Blue Notes, MFSB, Billy Paul, the Three Degrees, People’s Choice, the Intruders, Lou Rawls, McFadden & Whitehead, Teddy Pendergrass and Patti Labelle. While most of their classic hit songs are identified with the sounds of the ’70s, Gamble & Huff’s contributions to pop music were felt in this year’s Grammy Award nominations, with several categories featuring samples or interpretations of classic Gamble & Huff songs. Kanye West incorporated Edwin Birdsong’s ‘Cola Bottle Baby’ into his track ‘Stronger’; Michael Buble performed ‘Me And Mrs. Jones’ on his album Call Me Irresponsible, and Keyshia Cole included a sample of the O’Jays’ ‘She’s Only A Woman’ on her song ‘Just Like You.’ Other top contemporary artists who have incorporated the Philly sound into their recordings include Jay-Z, 50 Cent, Daft Punk, Mary J. Blige, Usher, Outkast, Bette Midler, Jennifer Lopez and many others. It was truly an honor to interview these legends on the eve of their Rock and Roll Hall of Fame induction. Before starting the interview, here is a partial list of the great Gamble & Huff songs: ‘If You Don’t Know Me By Now,’ ‘The Love I Lost,’ ‘Wake Up Everybody’ (Harold Melvin & the Blue Notes), ‘Me And Mrs. Jones’ (Billy Paul), ‘Backstabbers,’ ‘Love Train,’ ‘I Love Music,’ ‘Used Ta Be My Girl’ (the O’Jays), ‘You’ll Never Find Another Love Like Mine’ (Lou Rawls), ‘When Will I See You Again’ (the Three Degrees), ‘Don’t Leave Me This Way’ (Thelma Houston) ‘Enjoy Yourself’ (the Jacksons), ‘TSOP’ (MFSB), ‘Expressway To Your Heart’ (Soul Survivors), ‘Cowboys To Girls’ (the Intruders), ‘I Can’t Stop Dancing’ (Archie Bell & the Drells), ‘I’m Gonna Make You Love Me’ (Dee Dee Warwick, later covered by Diana Ross & the Supremes and the Temptations), ‘Don’t Let The Green Grass Fool You’ (Wilson Pickett), and ‘Drowning In The Sea Of Love’ (Joe Simon). Notably, “If You Don’t Know Me By Now” was covered by British group Simply Red and became a #1 pop hit. 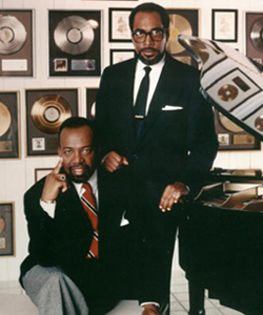 Leon Huff (left) & Kenny Gamble in 1986. JW: Congratulations on your Hall Of Fame induction. Where does this rank for you in terms of all of the awards and accolades over the years? Leon Huff: It’s at the top – a truly great honor and coming at a great time for us. We really appreciate being recognized this way, and the fact that the award is named after the great Ahmet Ertegun makes it even better. He was such a musical pioneer and it’s exciting to be mentioned in the same breath as him. Kenny Gamble: I agree with Huff – it’s the thrill of a lifetime, the dream of any music person that lets you know you’ve done your best. It reminds us of all the hard work we put into writing songs and making music over the years and we realize the intensity of creativity that was going on for so long. Our studio was literally on fire. Even some of the records we made that didn’t make it big still gave us a good feeling. JW: How did you first meet and get started as writer/producers? Gamble: The official story has us meeting in the band, the Romeos, that used to play locally and do college tours around Jersey and Chester and open for Chubby Checker. Members of that band later became the MFSB house band for us. But actually, Huff and I worked for different production companies in the Schubert Building, which was Philly’s Brill Building, a hotbed of local songwriters. He worked on the second floor, me on the sixth and we met on the elevator one day. We went over to Huff’s house in Camden and the first time we got together we wrote six or seven songs. It was right there from the beginning – magic, fun and easy. We decided to keep writing and we’ve been doing it ever since. Huff: Gamble hired me to play keyboards on one of his productions and the first recording was one for Candy & the Kisses. Philly was on fire with bands like that. American Bandstand was hoppin’ the way MTV did later and we felt like this was the kind of music we’d always be playing. We loved its swinging groove. JW: Were you trying to create a new sound for soul music or did it just evolve naturally? Huff: We were just trying to be ourselves and follow what our musical tastes were. We loved the sounds of the vibes, guitar, organ and all this stuff, and worked with musicians who played a lot of different instruments. Cameo Parkway, which had Chubby Checker, Bobby Rydell and Dee Dee Sharp, was a major record label and cultural force at the time and our offices are the same ones they had. In fact, ‘The Twist’ was recorded in the studios that became ours. We moved in when the Cameo vibe was floating around and just took that sound to another level. Gamble: We were into everything in those days, inspired by Frankie Lymon, the Drifters, Coasters, Flamingos, James Brown, Little Richard. If it was a good ol’ R&B singing group making live music, we were listening. The Philly sound came out of the way we set up our stable of writers and producers, and we used Motown as a blueprint. Motown changed the concept of the way record companies worked, and their power was incredible. Everyone was trying to copy them. Our main goal was not to copy their sound but to create a similar competitive environment for the creative people we worked with. What created all those great songs at Motown, and later at Philly International, was the fact that writers were competing fiercely with each other. When the O’Jays would come in, they might cut 20 songs to get eight good ones. Pictured (l-r): Leon Huff, Jimmy Jam & Kenny Gamble. JW: As things started taking off, did you have any idea of the impact you would make and the enduring popularity your music would have? Huff: We just fell into a groove, after we got in a favorable position by producing hits for Atlantic for Archie Bell, Wilson Pickett, Aretha Franklin, Dusty Springfield and Jerry Butler, we created our label and hooked up with CBS, a powerful outlet with worldwide distribution. After that, we could focus more on just making music and we went into a writing frenzy to feed the machine. Our deal with CBS was the perfect marriage, a match made in heaven. Once all of our records started coming out and the world realized they were all from this one building, that’s when they started talking about the ‘Philly Sound.’ But long before they coined that term we were perfecting our sound and were busy producers. We just made good records and everything followed from that. Gamble: With all of that attention, everyone started coming here trying to get the Philly sound into their music…Elton, Stevie, David Bowie, B.B. King’the same way artists wanted to match their sound with Motown a few years earlier. But they couldn’t quite get that sound because even if they used our same musicians, it wasn’t the same. There was a unique relationship between our original songs and the musicians who brought them to life. JW: When did you decide to start Philadelphia International Records? Gamble: We always wanted to have own label and had an indie label first, but when the indie business dried up, we entered the first era of associated labels. CBS had apparently done a Harvard study in the late ’60s and early ’70s about music trends and realized the enormous growth and potential of urban music. So we were at the right place at the right time, with the right music and the right people. We had the songs and the musicians – we just needed the finances and resources network to take it further. CBS afforded us that. The greatest part of this was that we were able to open our doors for other great writers like McFadden & Whitehead, Thom Bell and Linda Creed, Bunny Sigler, Jefferson, Simmons & Hawes, Sherman Marshall, Dexter Wansel and Hippy Gilbert. All become major parts of our sound and big R&B writers and producers in their own right. You can imagine the intense competition all that talent created! JW: How would you describe the Philly Sound? Gamble: Someone once put it this way: we put the bow-tie on funk! Huff: We were big into large-scale instrumentation that most producers wouldn’t think about. The sound of a French horn can be magnificent in the right contest. We’d use vibes, bells, baritone sax, flugelhorn and go the orchestra route and include the oboe and harp. Everything sounded harmonious together. Funny thing was, in our heads we heard all those things happening when we were writing a lot of our songs just on the piano in Gamble’s office. JW: How did you discover two of your flagship artists, the O’Jays and Harold Melvin & the Blue Notes featuring Teddy Pendergrass? Gamble: The O’Jays were from Cleveland and we first saw them at the Uptown Theatre here in Philly. Our friend, the DJ Ed Wright in Cleveland, called us up and told me the group was free from their previous recording contract and so we flew to Cleveland and talked to their manager. They’d had a few R&B hits like ‘Look Over Your Shoulder’ and had a growing audience, and we knew they were great, the kind of group we could write for. Once we got hold of them, we took a different spin and wrote songs we felt they could makes hits out of. We loved to watch them perform. Eddie Levert was always in control. Huff: They were originally five members and that evolved into three, but no matter how many O’Jays there were, they were at clubs in Cleveland tearin’ it up. Eddie and Walter Williams were amazing lead singers. As for Harold, the Blue Notes were a Philly institution since the ’50s and they had different members over time. We knew Harold, who was trying to get a new record deal in the early ’70s, and thought he had a nice smooth crooner voice, but we felt the group needed another singer with power. I was rehearsing one day with Teddy who was the drummer for the group, and told Gamble that this guy is something, he can really sing. And that was it. Teddy had it all – so fresh and green, a real natural talent. Those first songs he did in the studio, his voice sounded like a razor over the mic! JW: How did you guys collaborate? Did one of you write the music, the other the lyrics? What are your individual strengths as writers? Huff: This sounds so primitive now! We would go into Gamble’s office, where there was an upright piano. We would always have a Sony tape recorder running and then we’d start a conversation about world issues, what the flavor of world is, current events and things like that. Sometimes, innocent conversations can lead you into good titles, so we always did it like that. Then we would come up with song titles we liked, picking certain ones that sounded good to write about, like ‘Love Train.’ We’d start there and then just freestyle. I’d come up with groove, chord out the rhythms and just start playing. That would inspire Gamble and he would freestyle the lyrics. Gamble: Something Huff would play got my attention and I would just get inspired and words would flow out like poetry. I play guitar a little, but he’s the master piano player and I’m the lyricist. Once we recorded what he had, we’d listen back on the tape recorder and I would refine the words and we’d go from there. It was so spontaneous, like our own little rock and roll show in that room. JW: How did things work in the studio? Which instruments did you play, and who did the horn and string arrangements? Gamble: Huff played on majority of the songs, because it’s always a musician’s dream to play on his own compositions. We worked a lot with arrangers Thom Bell and Bobby Martin, but we told them pretty much how we wanted things to go and even dictated parts. Later while mixing, there was sometimes a process where we would all decide to rearrange things, take something out, put something in. Huff: Remember, when we were writing the songs, we listened to the playback so many times that we had a whole picture painted musically. So when it was coming together in the studio, if we didn’t like, say, a particular horn spot, we changed it. We knew every part and the music literally spoke back to us. JW: Which of your songs are your personal favorites? Huff : I really like all of them, even the ones that weren’t hits, but I’d have to say songs like ‘Backstabbers’ or ‘Used Ta Be My Girl,’ ‘You’ll Never Find Another Love Like Mine.’ I think the hardest one for us was ‘Me and Mrs. Jones’ because it had a different syncopation and flavor to it. It turned out to be a huge record, but we had to adjust to a whole other playing style on the track. Gamble: Writing and producing all of them posed unique challenges, every one. They always fell into place in the end because we paid attention to detail and wouldn’t let them go just any old way. We never gave up. If something wasn’t working one day and we thought it could be better, we’d come back the next day and do it again. They’re all our babies and all good. We like all of them! Mostly I love to listen to growth of our music over time. It’s not like we stayed in one place, doing the same old thing for very long. Our creativity and that of those we worked with continually blossomed like a flower. JW: Lastly, what makes a great song? Do you have any advice for young songwriters? Huff: A great song has to make you feel a certain way. Songs can make you happy and sad, they can help you fall in love…they have to do something. That’s when you get a reaction. There are some songs on the radio that just play and you don’t even know they’re there. You hear others and immediately turn it up. There’s something to that. It’s got to capture your ears, because that’s where it hits you first. Then it’s got to soothe your soul. Gamble: I always advise young songwriters not to put all your eggs in one basket to begin with. Don’t pressure yourself to be a starving songwriter. Before we made a living at this, Huff and I wrote on evenings and weekends and worked other jobs. Get your education, get a good job and then follow your passion. And when those songs start paying you, then you can do it fulltime. We know people who say they can’t do anything else and that’s simply not true. We had jobs, we were responsible people, and eventually we were thankful we had royalties coming in so we could just write after awhile. It’s a very blessed thing when it happens.